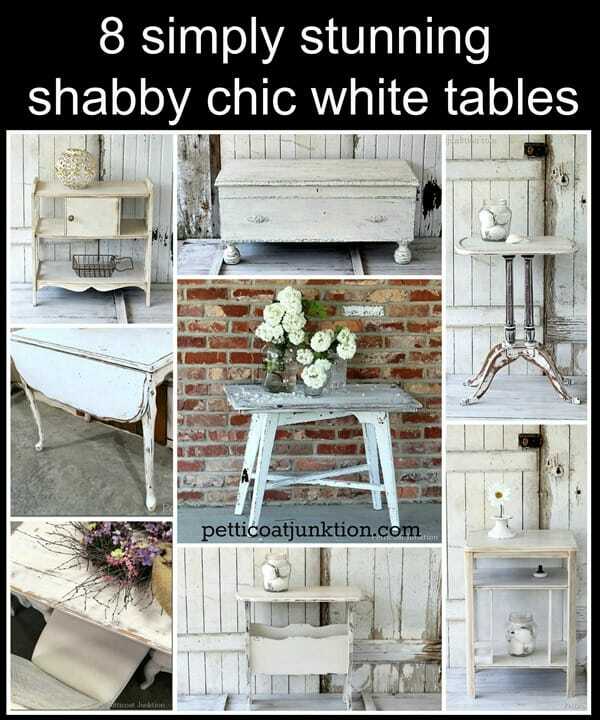 Shabby chic white furniture fits into any decor. I have 8 shabby chic projects to share with you because, well, I was hoping to have my latest project finished up for you today. But it didn’t happen. I’m having a hard time getting back into the groove after my vacation. Since it’s Summer time and I’m still feeling the love for shabby chic furniture…I rounded up 8 favorite shabby chic white table projects. Here they are…..all in one place. The Vintage White Chalk Paint Drop Leaf Table and Turquoise Spray Painted Frames are a must see. The table was a complete mess when I bought it. The Antique White Table was sitting in our living room until just recently. I changed it out and gave it a paint job in preparation for selling it. This is one of my favorites and I returned it to our living room after painting it. ….Table With Antiqued Effect…….and it’s still here. I painted this cedar chest and loved it……MMSMP Cedar Chest but since then I’ve painted it about 4 more times. Getting ready to paint it again. I still have this table too…..Cottage Chic Magazine Table. A friend commented the other day that my living room was so brown. She expected it to have more color because I love bright colors. I mostly accessorize with bright colors but stick with neutrals for the fabric furniture. I got in trouble from some of my readers for painting this table….. Shabby Chic Table. The original finish was really pretty but the table was missing some veneer and I knew the detailed legs and feet would look pretty painted and distressed. So I painted it. I wish I would have kept it for myself but too late now. Plus I can’t keep all the furniture I paint. The paint on this piece chipped perfectly……Have To Love ChIPPy White Paint. The hubby and I put the table together from reclaimed parts. The base of the table is very modern. I love everything about these chairs…..Drop Cloth Seats and White Painted Chairs. The dining room chairs are the kind with the cane back and fabric seat. Those cane backs look so good distressed and the drop cloth seats are the perfect neutral covering for the chair seats. I painted a junk store table to go with the chairs. The table of course is shabby chic white. What did you think of the projects? Which was your favorite. Is shabby chic furniture still in style? Really love all of them but top left and magazine table are my favorites. Do you have lots of luck finding reasonably priced pieces to fix up? So mad at myself for not buying table very similar to your magazine table few weeks ago at our local thrift store. Seems like when they have good stuff I don’t have money to buy them. All these darned 5 weeks between SS paydays make it hard to stretch money. Ok now I’ll have to find couple tables to redo. Just now as I typed that I happened to remember have couple out in shed, need to sand well then get to it. Bought them last year but then they got buried in shed but am having a very big impulse to fix them up to sell, (hopefully). Making a mirror: always so creative! Who woulda thought? Thanks again.